The purpose of my study on this relatively small reserve was to try and identify how many leopards were using it as part of their home range. Leopards were rarely seen on the reserve but signs of their passing – scats and tracks – were plenty. The fact that there was only an occasional lion passing through the reserve lead us to believe that perhaps the leopard density was greater than expected. So a colleague and I set out to try and identify the individuals using camera traps. Part of our strategy was to look for animals killed by leopards and then set up camera traps nearby in the hope that we would get plenty of shots of a leopard with which to start identifying spot patterns. The method worked well except it meant spending a lot of time hanging around decomposing carcasses. It’s amazing to see a leopard usually thought of as picky munching on a rotting carcass that you would think was fit only for spotted hyenas and vultures. In fact we had a wealth of animals recorded at these carcasses. As well as the expected leopard and spotted hyena we recorded brown hyena, jackal, honey-badger, civet, bush-pig, warthog and even a kudu picking at the remains of ruminant. Needless to say the high smells made us super efficient at putting up our cameras quickly. The leopards on our reserve were not under pressure from lions and so tended to stash their kills under bushes rather than up trees, probably to keep them out of sight of the vultures. This meant it was easier to set the cameras. On a number of occasions we would return to a kill to collect the camera only to find the bare bones strewn far from the original bush and thousands of pictures of squabbling vultures. Whilst out scouting for leopard signs, I once came across a dead juvenile baboon. It was lying at the bottom of a power pylon that the baboons would sleep in at night time. It had no obvious injury so I presumed it had fallen from the pylon that night. I decided to put up a camera trap at the site as leopard in this area are quite partial to baboon. I left the camera trap for two nights then went back to check. The baboon had gone and I had around 150 shots on the camera. What I found on those shots is why camera traps are so fantastic. Over 80 shots where of the troop of baboons returning to the site at dusk. The troop of 30 or so baboons each spent time with the dead individual, some touching it, some just sitting around it, some sniffing but for over an hour they remained with the dead individual as if saying good bye. The troop seemed more fascinated with the body than distressed. The following evening, the body by now grossly swollen, four juveniles came close to touch again but then ran off. I think the smell must have scared them. After dark, two spotted hyena came and took the body away. The leopard evaded us this time but thanks to the unobtrusiveness of camera traps we where privileged to witness an amazing moment in the life of a baboon troop. Fascinating post, Margaret, thanks! I hope there are many more. Thank you for such a great post. The nature of animals never fails to be fascinating. 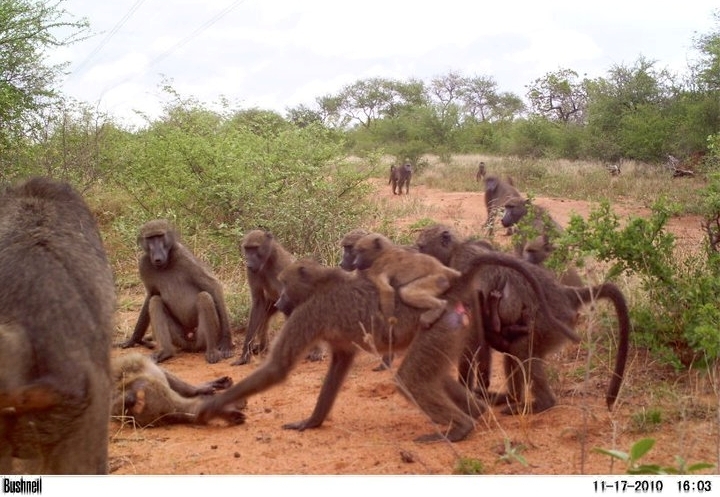 Could this be evidence of a baboon funeral? Very interesting behavior. So far in my volunteer efforts for Snapshot Serengetti I have not run across any carcasses. Thanks to Lucy for such a fascinating post. As a participant on this project, one of the things I find most compelling and fascinating are the candid glimpses we get into the lives of the animals photographed by the camera traps.